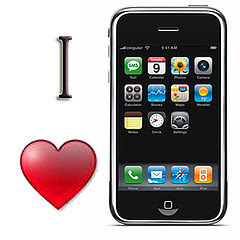 Angel in the Sickroom: I ♥ my iPhone! I told myself that I wouldn't get myself an iPhone because I didn't want to pay $50 per month for the plan but I guess I didn't convince myself too much. I just realized that the extreme usability and convenience of having an iPhone completely outweighs the monthly cost. Well I do spend around $20 for my cellphone prepaid credits so why not spend an extra $30 for great features like being able to check your e-mails, browse the web, and even navigate around the city! My main reason for buying an iPhone is the Google Maps Application! It's actually more of a need than a want because I need to know what buses to ride to get to places and I need to know what buses to take, at what time, and what bus stop I should go to to arrive at any destination I need to go to. Well I was a bit put off when I realized that the GPS wasn't actually that accurate because there are times when the map show that I jumped to another road when I was walking so relying completely on the iPhone is not that good of an idea. But still, knowing what time the bus will arrive at the bus stop saves you from freezing outside when it's winter. My iPhone serves as a great organizer, dictionary, calculator, converter, gaming console, and all around entertainer. And with hundreds of apps to download, the use of your iPhone is limitless! I'd say it again, I ♥ my iPhone!